Summer is here and the weather is turning hotter. If you haven’t started your outdoor entertaining it’s not too late to begin. This time of year offers many opportunities for produce to play a roll in your summer social calendar. Corn, portabella, and zucchini on the grill. Honeydew, cantaloupe, and watermelon for breakfast, or fruit salad. Grapes for snacking. And, of course, carrots, cucumbers, and peppers – for dipping. But your veggies don’t have to be a mere vehicle for a dip. They can take the driver’s seat too. Here is an easy, great tasting vegetable dip to serve at a back-to-school party, a football tailgate, or a gathering of friends listening to the latest podcast of An Organic Conversation. Let’s start with basil. Often used as a seasoning to enhance the flavor of vegetables, just think of the possibilities when it’s put front and center in a homemade basil hummus. 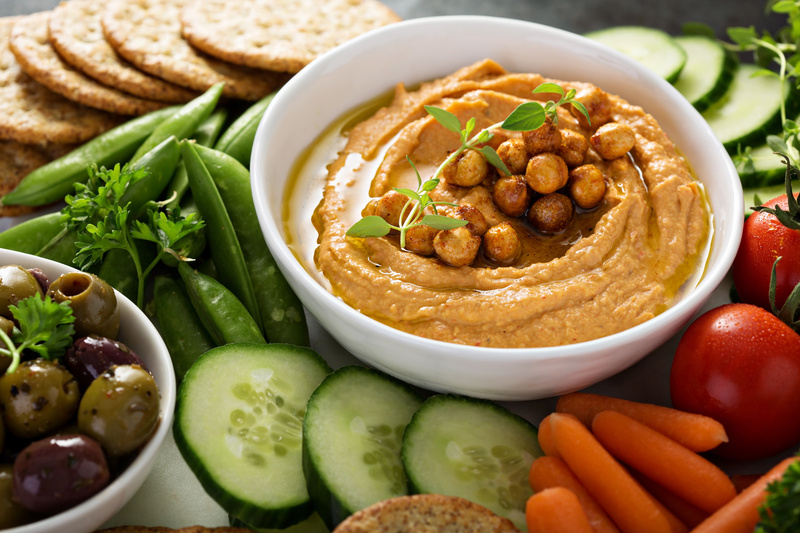 This high protein spread is simple to make and has all kinds of uses: a fantastic addition to a grilled veggie platter, a wonderful sandwich spread or even rolled up in steamed chard leaves as an appetizer. Puree all the ingredients in a food processor or blender until creamy. Add additional oil, if necessary, for desired consistency. Check out our 15 minute roasted red bell pepper hummus recipe too. So much summer ahead, So many dips to make! Thank You, sounds delish can’t wait to make this.